It’s been a while since my last post and today I am thinking of sharing some learning lessons from thomas edison famous quotes that I have read through the book that I have picked up in my local public library. Recently, I went to my local public library to look for some inventors’ biography and managed to find a photobiography of Thomas Alva Edision called Inventing The Future. I have been wanting to read up some successful people biography for quite some time and have finally managed to pick it up from the local public library after some conversation with my colleague. One of my goals for this year is to read up at least 20 books but so far I have only picked up 2 books only. I do really need to pick up on my own engine so that I can read up more consistently. I have decided to read up more books along the way and share with my viewers on this blog what I have learned through reading the book so that I can be more committed to read more books. If you find my blog post helpful to you and want to cheer me up to read more books, do comment in the comment sections to connect with me. 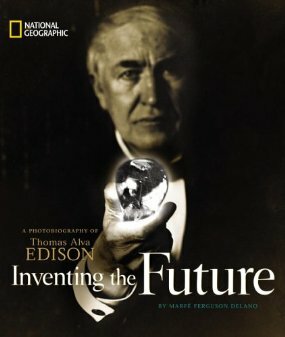 Through reading the Thomas Edison’s photobiography: Inventing The Future, I found out that Thomas Edison is not really the first guy who invented the light bulb. There was another guy before him who invented the light bulb and he was just improving the light bulb’s idea to allow more people to use it for home usage instead. Another myth that I found out was that thomas edison did not really personally create the light bulb himself and failed 10, 000 times like what most self help gurus mentioned in their talks or books. There was a team of people around him where he gathered together and created a laboratory to work on the inventions. His laboratory is considered as a Research & Development (R&D) department in today’s big company where they work on ideas to create the product. This shows the importance of forming a mastermind group of like-minded people if you are really thinking of making something big with your idea as they will really push you to great heights. Another thing that I found out is that Thomas Edison did not really formerly finished his studies when he was young, the school teacher did not give good comments about him due to the child’s persistent questioning and seemingly self centered behavior. Thomas Edison’s mother fought back by praising Thomas Edison in front of the teacher instead and in the end took up the important role of educating him personally. It seems that his mother’s faith in him had motivated Thomas Edison to study hard and picked up the interest of reading along the way. If you have read the thomas edison famous quotes that I have shared with you above, you will really learned a lot as you can see his persistence and positive attitude towards life and his own journey to success. I hope that you have learned something from this blog post and do comment in the comment section below if you love what I have shared with you today. « Watch This Three Feet From Gold Documentary!